Alright, I confess, for those of you following yes, this is a back post BUT, at the ship’s usury rate of 0.75 per minute I took really good notes. I have all sort of things to tell you scrawled in boo-hand (which is much shorter and more cryptic than short hand) so I will start my de-scripting backposting story fun. First, day 1! 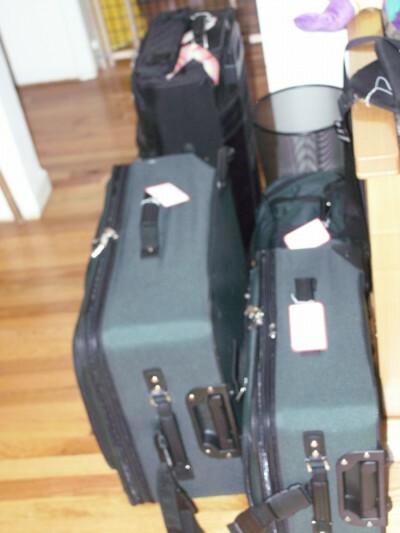 There’s the luggage, all in soft focus like. I thought I’d add a touch of romance to our waiting pile of suitcases. I need to either eat more before the show or endeavor to spill the entire long island on Paul the Other’s lap because this half assed partial drink spilling is so nickel and dime, you know? Next year I’m going for the whole glass, ice and all! 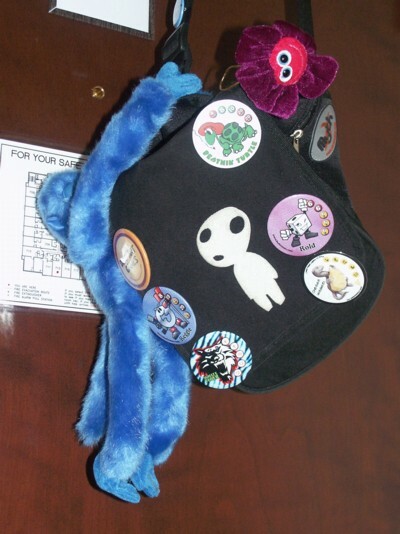 The Alien Mushroom Man is slowly being hemmed in by buttons. Oh, and a blue monkey. See, they really do love me. Yo. Why does word hesitate all the time? I just waited 8 seconds for it to double return from the title so I could have a space between it and my writing. That’s just not right. ANYWAY, I had plans, some different plans, no plans and a nap. In that order too. The bottom button says it all. I survived my last work day, barely, and the interminable drive through the last little bit of Michigan, which is only 40 miles yet seven hours of drive time. No really. It kept not being Ohio for the longest damned time until I thought we might have actually slipped onto a tread mill part of the highway. Hey, they do have test highways on the way down so you never know. Twenty Four hours! This is me doing the happy squee dance [*HappySqueeDance*] and this is me also annoying every living person within a three mile radius. *HappySquee* *HappySquee* Hey, I can enlarge my annoyance radius with the help of the internet! Whoo! Have a *HappySquee* on account, you internet readers. There is enough *HappySquee* for everyone. Is today just one of those zippy days full of energy or have cockroaches always been that fast? I’m not sure since today is the first day in a long time that I have felt awake and full of zest so it may just be one of those days. On the other hand, cockroaches that can not crawl Mach 1.5 across the carpeting do tend to get squished more often than those that can. I don’t know, but the net result is that a whole lot of people and critters have more energy than they know what to do with (I’m looking at you too, cats. Don’t think I didn’t notice the crack crazy kitty antics). Alright, I’m not sure how this is even possible but I have become a lethargic spaz. I have been sitting here with half a piss poor paragraph written about something or other work related that I should have wrapped up Wednesday. But no, I just keep looking at it thinking “Yup. That’s pretty bad. Huh.” and then I look some more at it, write a sentence, delete it, write the same sentence again (just in case it got better between the time I deleted it and then rewrote it I suppose) and on and on. I still only have part of a paragraph and I’ve had the damned thing up on the computer for three days now. A third grader could have written it in half the time (and probably twice as well) but whatever. You know? Meh. My main motivation is to make it through the day and then maybe get a good nap in when I go home. On the other hand WE’RE GOING TO BE ON VACATION NEXT WEEK! Whoooo! I’m only working three days next week (count them!) and then BAMN Origins and all sorts of geeky whacked out fun! Plus, after that we come home for a day or two and then we are off to ALASKA! Honeymooning cruising madness for seven days! That’s seven days I’m not at work AND seven days that I’m in Alaska with TheMan on a boat (ship)! I’ve never been to Alaska, we’re going on a CRUISE! Whoooo! *spazzy dance* OK, that was a lot of energy, I’m going to go find a quiet place to sit and vegetate. The 3:00 deluge came early yesterday (as Alessar and I were walking back from lunch) and it hasn’t really gotten off its duff and left yet so I’m all sorts of sleepy. The deluge also didn’t really get up to doing its raining best so we’ve had pretty much non stop gray and drizzle since about 1:00 yesterday. *yawn* It’s a very hot cocoa and snuggle under the covers sort of day, which poses a small problem in that I’m at work. Come on coffee! Alright, I am starving and it’s not even break time. What up that??? I can understand the Monday before break stomach attack because, damn a work Monday starts really, really early. So, what’s with me giving my sammich the starving eyeball here on a Tuesday? One would think my body had Monday to get used to the early to rise and eat accordingly schedule but it doesn’t seem to have taken. Hrrrmph. Posted in Uncategorized | Comments Off on I Deserve An Elephant! Here’s a picture of all the demons that live in the “I”. Heh, OK not really but it’s about as photogenic as he gets, which is really sad. For every good picture I get of my co-dependent but vastly independent (in his kitty dreams) cat, I have like 12 incredibly cute ones of Vande. The poor “I”, and it’s his and his demons’ birthday today too. Word, Wandering and Wanna Wanna Sweetie! My desk is utter chaos. I just organized a goo gob of papers and they have all up and wandered off. I’m tidying up too, which may be a really sad statement of affairs regarding my cleaning skillz. Hmmm. Well then, I guess I don’t have to file those AWOL paper right? A silver lining every time. 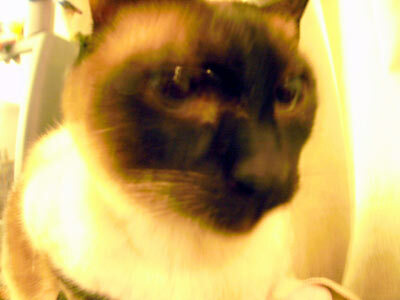 Posted in Uncategorized | Comments Off on Word, Wandering and Wanna Wanna Sweetie! You are currently browsing the Booniverse weblog archives for June, 2004.